A formula, or algorithm that analyzes the information in your credit file and returns a number or score. Your score indicates your risk to creditors or lenders. The lower the number, the more risky you are determined to be. See: What is a credit score? What is in my credit file? Names and addresses the credit bureau believes (rightly or wrongly) have been used by you. Your positive credit history: creditor, type of credit and, if ongoing, the current status of the account. Your negative credit history: past due payment history, collection accounts. Public records of bankruptcy, repossession, liens and judgements. What information is not in my credit file? Your age, race, religion, national origin, gender, marital status. Soft credit inquiries: when you check your own credit report or someone sends you a pre-approved offer. Your bank account activities or interest rates on existing credit or loans. Excluding some public records concerning taxes, seven years. Note: this is how long is legally allowed and how long it should be on your report. We often find negative information on credit reports that violate this law. At least 660 for your FICO score. What is a FICO score and why is it important? FICO (Fair Issac Corporation) develops computer models to determine lender risk. The level of risk is represented by a number: your credit score. This is the credit score over ninety percent of lenders use. There are different FICO score models for different types of credit: auto, credit card and mortgage. Mortgages lenders use scores that are different than other scores. The only place to get your FICO scores is from MyFico. What about credit scores other than FICO? Non-FICO credit scores are called FAKOS. These are not used by lenders and are for educational purposes only. This is the score you often get for free from free credit report websites. What credit score do I need to get a home loan? The minimum credit score for a home loan is 620. This is a FICO (not FAKO) mortgage midscore, meaning the middle (or mean) score of all three credit bureaus. The score model used for mortgage lending is different than that used for auto loans or credit cards. These scores may be different for the same person. Where do I find my home loan credit score? From a mortgage professional you authorize to check your credit. You can get your mortgage FICO scores from myFICO.com. Scores from free credit report websites are not FICO scores and FICO scores from credit card companies are not mortgage scores. What causes my credit score to go down? Your credit score is a measure of you history in using credit. If you use different kinds of credit – keeping all your commitments perfectly – your score will increase over time. History is time, the longer the better. Your score goes down with lack of credit history, late payments, repossessions, bankruptcy, liens. Lenders to whom you apply for credit. You when you request them. Can an employer see my credit score? Your employer, or prospective employer cannot see you credit score, but they can see much of your credit history by getting an Employment Credit Check (only with your permission). Does income matter to my credit score? No. Rich, middle class and poor people can all have high scores - or low scores. Your credit score is a measure of your ability to keep credit commitments. Lenders use it for this purpose, not how much to lend. Your income, and debt, determine much credit you can afford and how much credit lenders will extend to you. A credit score is a mathematic formula applied to your credit history (your record of handling credit) at a credit bureau. 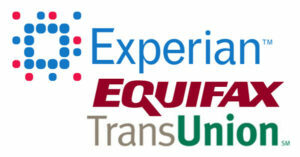 The main credit bureaus are Experian, TransUnion and Equifax. This formula is called a credit score model. The resulting credit score is used by lenders to judge how risky it is to extend credit to you. The higher your score, the better for you. There are a lot of different credit score models. And, to complicate it further, different creditors can report to different bureaus. A creditor can report your history to one, two, three or none. So, your credit history – used to calculate your credit score – can be different at each bureau. Different score models, based on different credit histories equals different credit scores. It’s as if you took a test and different teachers used different parts of it to grade you on different curves. Your grades likely won’t be the same; the chance of all your credit scores being the same is pretty much zero. When you are applying for a home loan, the only credit score that matters is the one used by mortgage lenders: your FICO mortgage midscore. How do I get my credit score for buying a home? The credit score used for home buying is your FICO® Mortgage Midscore. And there's only two ways you can get it. From a mortgage lender after you’ve applied for a loan. All lenders who check your credit are required to tell you your scores. You can ask the lender after they’ve checked; or wait until you receive their official disclosure in the mail. If your loan was denied, you'll also be told the reasons you were rejected. Your 3-bureau report will have your scores based on different models. Look for the mortgage scores section, and take the middle score of the three bureaus (see example). These reports are not free. While getting your score from a lender is free of charge, a new credit inquiry will be added to your credit history. One inquiry is no problem, but if there are several over time, the inquiries will decrease your credit score. This is, usually, not a lot a points, but a few points can make a big difference in many cases. If you purchase your report from myFICO.com, there is no inquiry affecting your score. You’ll also get much more information from your FICO® report than you will from a lender’s disclosure. Need Help With Your Credit Score? We work nationwide – in person or by phone and internet. We're here to help you increase your credit score to achieve your dreams. Please let us know if you have any questions or special circumstances that we can help you with. Use the form to send us an email and we'll get back to you quickly.